In late 2008 we were planning practical outcomes for WILD9 (the 9th World Wilderness Congress), with The WILD Foundation and our partners trying to create better wilderness awareness in Mexico and better cooperation for wilderness in North America. Patricio Robles Gil — the great Mexican conservation photographer and artist, and our partner in creating WILD9 — suggested to me that we visit with our colleague Juan Elvira Quesada, Mexico’s Secretary of Environment, and present to him the long-dormant plan for a transboundary park along the USA/Mexico border in the region of Big Bend (Texas) and Maderas del Carmen (Mexico). It was not easy. National security issues, continued bad news on the border with drug cartels, immigration, weapons smuggling, and all the rest had created a stone wall of attitude. President Calderon was clear: do not bring me the idea until all my Ministers agree…and many of them did not. Juan Elvira worked on each of them. The USA was the USA (of late)…..in a box. Undaunted, Juan Elvira took advantage of the newly-elected Obama administration’s message of cooperation and hope. He met with the incoming Secretary of Interior Ken Salazar, who was just getting his feet under the desk and was interested to know more details and be kept informed. Using very strategic diplomacy, Secretary Elvira then went straight to the White House and President Obama’s National Security Advisor, General James Jones (US Marine Corps, retired). Jones liked this out-of-the-box idea and thought it would help create a different and positive image of national security. The White House engaged. Ken Salazar got on board. It began to roll. 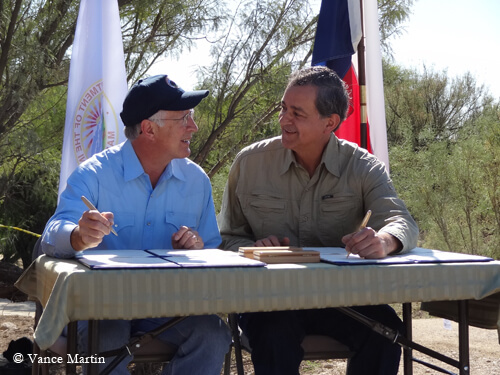 Almost three years after our first meeting and 67 years since President Roosevelt’s letter, and after much work by all land management agencies and embassies on both sides of the border, on 24 October 2011 we met at a signing ceremony on the banks of the Rio Grande/Rio Bravo River at the Big Bend National Park. Hosted by Big Bend National Park Superintendent William Yellman, members of all federal land management agencies, local conservationists and school children met with the two Secretaries — Juan Elvira and Ken Salazar — plus the Chief of the US Border Patrol, the US Secretary of Health and Human Services (Kathleen Sibelius), Head of CONANP (Mexico’s National Parks) Luis Fueyo, and US Ambassador to Mexico Anthony Wayne in a gathering that Yellman called “The biggest gathering of big brass ever assembled at Big Bend!”. 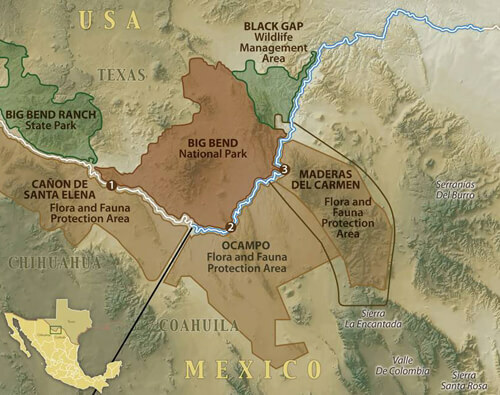 The Natural Area of Bi-National Interest was officially launched, creating a new consciousness and practice of international cooperation in a 2 million hectare (5 million acre) area of the most bio-diverse desert ecosystem (the Chihuahuan Desert) in North America. I spoke with Juan and Ken Salazar as we looked over the river into Mexico at the tiny village of Boquillos and the towering El Carmen escarpment, and we marveled on the conservation achievement and potential of this initiative. As the day moved on, I also marveled at something else…the obvious respect and genuine friendship between the two Secretaries. Ken Salazar spoke to Juan Elvira using the personal and affectionate “Juanito”…surely this was a first in US-Mexico relations! And it all came together because of protecting wild nature…. For more images, view the slideshow below! Vance, thank you for a ‘positive’ message of cooperation that shows international caring for wild species and their habitat. Your vision and persistence have made and will continue to make a difference. Congratulations Vance, WILD, Mexico and USA. What an achievement!! Truly inspirational and such an important land-mark in cross-border conservation and cooperation. Well done, and thank you! It is truly good news to read about the Big Bend/Rio Bravo conservation success, and WILD should be congratulated on its role as catalyst. It is reassuring that in spite of all the trials and tribulations that have for so many years soured realations both sides of the border, it has taken the spirit of wilderness to overcome the intransigence of politicians. The joining of areas north of the border that have been conserved for many years with newly conserved areas on the Mexican side presage a new spirit of cooperation between the two neighbors. 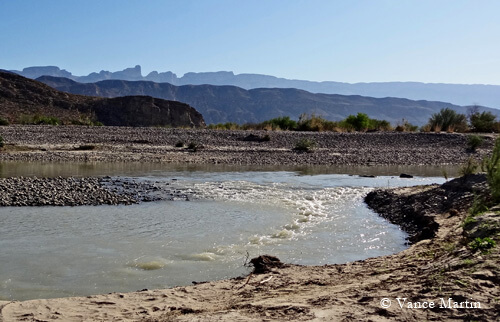 After all, El Carmen, the catalyst for the Mexican initiative, received the first wilderness delegation in Latin America; and this has been joined to Big Bend National Park that is managed as wilderness across the river. Mention needs also to be made of the role that the private sector played. Initially CEMEX played a lead role in amalgamating private lands, and other private landowners have contributed their properties to this vast new conservation area, for there is little public land in Mexico. 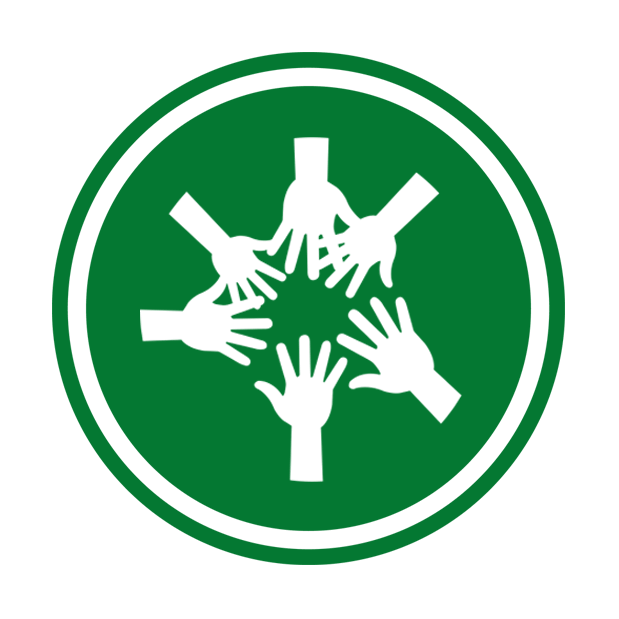 In additiuon, many Mexican, American and international NGOs made important contributions. The World Wilderness Congress is all about bringing all these disparate resources and energies together to perform the otherwise impossible. Thank you, Patricio: thank you, Vance! This is a vintage WILD accomplishment, helping facilitate conservation achievements thru the Congress and other activities surrounding Congress planning. Congratulations Vance and our WILD partners who worked unseen behind the scenes to help make this happen. Vance this is a monument to dedicated conservation from your and the Wild’s side. Sincere congratulation. So excited to see this initiative revived, and at a most opportune moment. I think this story also shares a lesson, that a small group of people, can strategically utilize traditional diplomatic channels to advocate for environmental peacebuilding as a tool for transboundary cooperation in a crucial ecosystem for North America! Bravo! Muy Bien!